We’re another month on with our support for Forget me Notts, and we’ve made further great progress since our last update. More referrals being fulfilled – more areas in dire need of help. In the whole 2018 Forget-me-Notts were able to help 167 children within 87 families. As at 4 March 2019 help has reached 62 vulnerable children. The statistics speak for themselves. But there are children in need all over the UK and we are now looking to expand the Forget-Me Notts project into other towns and cities, to help other local communities in turn help vulnerable children and families. This has already started working …..
After using our extended network to announce our partnership with Forget me Notts, we were contacted by a friend in Wales who is working in social care. They are working with a Mum who has lost everything due to ‘cuckooing’ – this terrifying situation combined with a volatile relationship has forced her and her little boy to flee from England and relocate to Wales with little else but the clothes on their backs. They were in desperate need, so with the help of the local community, Forget-me-Notts have been able to help them and complete our first referral in Wales. This may be the beginnings of a new hub in the area, fingers crossed. 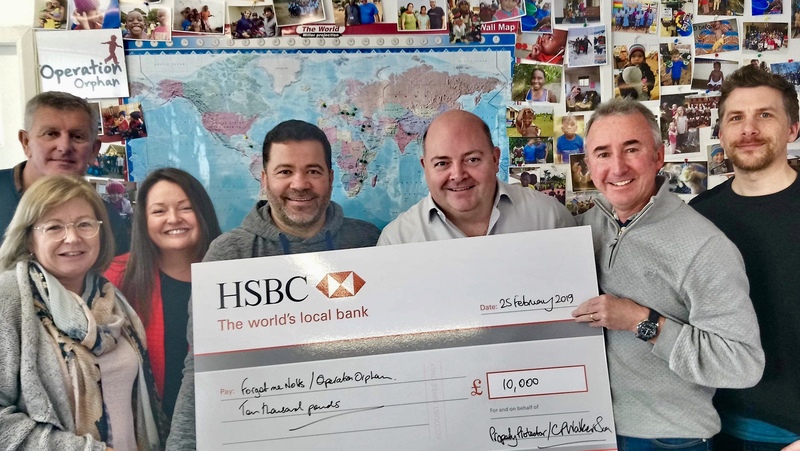 We were invited to attend the last trustees meeting at Operation Orphan’s HQ, where we heard more about how the money is being spent on the UK project, in addition to other key projects across the world. We took this opportunity to pledge a further donation to the charity. As part of our continuing 120th Anniversary celebrations, we are proud to have been able to donate a further £10,000 to Forget me Notts, at a surprise unveiling at their trustees meeting, further securing additional resource and funds for more and more referrals. We always said that we wanted to get involved at the grass roots level of Forget-me-Notts, and one of our partners has committed to help as a volunteer, helping fulfil referrals, help in the warehouse, help … well whenever and wherever required. We can’t do this on our own, so we’re asking for help and would like to partner with likeminded businesses, friends and colleagues across the UK. We’d like to develop other hubs across the UK, starting in some of the most needy areas. Can you help? North West England, North East England, South Yorkshire are our next target areas. If you think you can help with regular sustained monthly support to expand a project near you, please get in touch.